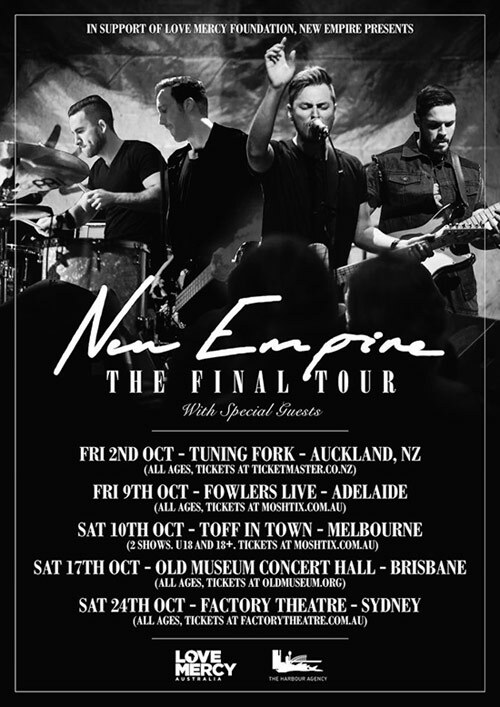 Australian rock band New Empire may only have released their Tooth & Nail Records debut in the United States a year ago, but the band has been active Down Under for the past 10 years. Still, the it comes as a bit of a surprise to hear that the Syndey band is calling it quits. The band announced on social media this week, "Hey gang, Jeremy here. After ten years, 3 albums, thousands of friends and countless memories, we have decided it is time to call it a day for New Empire. The past ten years have been by far the best, most rewarding (and the most challenging) times of our lives. This decision has not come lightly, and honestly there has been many times when I was fighting it and didn’t want to close this chapter - but there's a real peace in knowing now is the right time. After releasing our most recent record 'In A Breath', it felt like a completion of a season. We are able to celebrate what was, and also know it's time to move onto the next adventure in life. From the day New Empire began as 19 year old kids in Kale’s Cronulla garage, we have seen the band totally as a gift from God to create music we love, inspire others to do likewise, and hopefully love everyone we encounter along the way. I can't begin to describe our love and respect for our fans and friends - you who have shared in this journey with us around the world - from road tripping in an RV around Nth America rotating night driving shifts and trying not to die, to touring with many artists we admire, to unforgettable weekends camping at Parachute and Easterfest festival communities back home. It's been a privilege to rock out with you in your car, through headphones during the morning run, or at a venue late into the night. We love you. So now you are invited to join us for one last time, 'The Final Tour' as a final celebration together in Australia and New Zealand. We're determined to make this tour the best we've ever done, and we'll be playing many songs from all three albums this October. We're also really excited to be partnering with Love Mercy Foundation who are an incredible charity organisation doing phenomenal work changing lives in Uganda, Africa. Our final music video and single 'In a Breath' will be released today. It is dedicated to you, and especially anyone who has lost a loved one far too early in this life. To our parents - Robyn, Karen, Janice and Ross - we love and miss you. Thank you for your love and support. It's been wild. Jeremy, Kale, Kyle and Nate"
For the latest on the guys, visit their Facebook page. For more info on New Empire, visit the JFH Artists Database.